We've got some exciting news regarding our website! 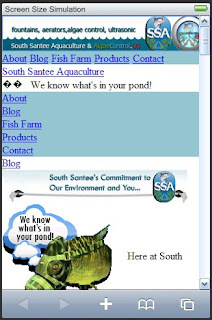 You can now access South Santee Aquaculture from your mobile phone...even while standing in the middle of your pond! We recently brought in another terrific set of products to the South Santee Aquaculture arsenal. Introducing the Texas Hunter Directional Fish Feeder. Texas Hunter’s directional fish feeders were carefully engineered and designed with reliable & convenient performance features, making these fish feeders the clear choice among pond management professionals and lake owners across America. The Directional Fish Feeder comes with options to suit your capacity! Either way, you'll enjoy the convenience of the most consistent, reliable fish feeders ever designed! You may even want to read: 10 Things You Need to Know Before Investing in a Fish Feeder. Give us a call for pricing and availability!